Entering college is a transitional experience. For traditional students, it may mark the first time they have been away from home for any extended period of time, or the initial steps into adulthood, freed from the oversight of parents and at liberty to make their own decisions. This can be a challenging adjustment for even the most well-prepared. Entering the military is also a transitional experience, and parallels the experiences of traditional college students in some ways: those who enter active service right out of high school may also be away from home for the first time, and unfettered by the protective and watchful gaze of parents. Both venues provide opportunities for growth, surrounded largely by people of similar age from all around the world. Students and service members are offered the possibility of world travel, though in the case of the latter, it may not always be as benign as an overseas duty station; deployments are still a striking reality of service. Both can open up new opportunities to become marketable by providing education and training. And both vets and alumni seem to share a similar nostalgia for that period of growth and of youthful exuberance, and of the establishment of lifelong friendships. I came to Michigan State University in 1997, as an 18-year-old traditional student who spent the summer after my senior year in basic training for the Michigan Army National Guard. Times were different then: the country was at peace and was generally prosperous, and my service entailed playing baritone saxophone in uniform. It afforded me world travel (Alaska and Latvia were two of my annual training destinations) – something I’d never been able to do – but was light on the ‘military’ component of service. Drilling meant rehearsals, parades, and concerts, not field exercises, ruck marches, and lanes training. In effect, I was much more college student than service member. And as a result, I enjoyed a typical college experience, complete with the sense of belonging to the Spartan community that comes with it. I lived in dorms for the duration of my career, and had the extreme good fortune of participating in a study abroad for my last semester. In short, I had the best of both worlds. My second experience has been different: I’m much older, with a stint of active duty and a deployment that came in the wake of 9/11, when I decided that it was time to really give back for the ‘golden years’ I’d enjoyed in the band. I’m not here with high school friends, and I came loaded with grown-up responsibilities like car payments and a mortgage. 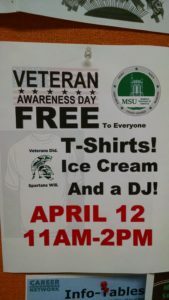 I still enjoy a long-standing connection to MSU, but I also feel like I stand apart from the community, and it made me wonder how other veterans experience life here. While many are younger than I am, and not really much older than their classmates, they also have a lifetime of experience packed into that term of enlistment: experiences that most will never be privy to, let alone share. My shared experiences make me an ‘insider’ but my Spartan history makes me less so. Student veterans are non-traditional. Not only are they older, but they often come from lower socioeconomic strata; a college degree makes a person instantly eligible to become an officer, and the military still has a deeply entrenched class stratification as a result. Officers are educated, and are trained how to throw dinner parties in conjunction with more standard military training. They are the upper class, and the enlisted make up the lower class. Few choose to go that route with degrees in hand, and (at least in my own experience) forever field the question ‘why aren’t you an officer?’ as a result. This means that one of the best opportunities the military provides to vets is the chance at an education through the GI Bill. 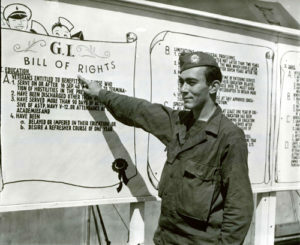 Originally ‘The Servicemen’s Readjustment Act of 1944,’ this piece of legislation gave veterans a chance at an education at a time when it was still very much the domain of the upper classes. It effectively changed the face of education at the end of World War II; as veterans returned home, many took advantage of the bill, and at its peak in 1947, almost half of all new undergraduates in the US were vets. Today, the GI Bill continues to enable veterans to pursue degrees across the country, and many make use of the benefit. The current Post-9/11 GI Bill pays 100% of tuition, as well as a monthly housing allowance to cover rent and a book stipend. However, it also comes with some restrictions which can pose a real hurdle for student veterans on campus. Many vets start taking online classes while still in the military, and then transfer to a residential status after separation. Plus, the military offers free College Level Examination Program (CLEP) tests which enable service members to test out of college requirements; they work very much like AP exams. As a result, veterans often arrive on campus as transfer students with many of the core requirements already satisfied. Unfortunately, the GI Bill will only pay for classes that are required for a vet’s degree program, and vets also must be full time students to take full advantage of the GI Bill. This has created academic and financial challenges to vets that are unique to the GI Bill, as vets are forced to play Tetris with class schedules each semester to ensure they get what they need- and ONLY what they need. Thankfully, Spartan vets will get an assist with this moving forward: thanks to the joint efforts of the Student Veteran Resource Center (SVRC) and the university, MSU will now offer priority enrollment for students on the GI Bill. Administrative challenges are the norm for veterans. 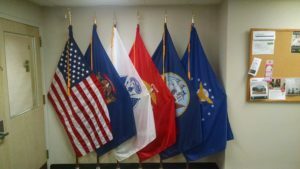 I interviewed Sam, a former Marine and student here at MSU, who told me that many of the particular limitations of the GI Bill are things she handles herself. High on the list is the lack of training for academic advisors. Advisors here are not trained on the expectations and limitations of the GI Bill; while some enterprising advisors have educated themselves on the issue, they are the exception. “The advisors are not prepared for veteran students. And then they try to advise me but I’m like ‘you don’t understand that – I know that’s not gonna work for me.’” Later she noted “They advise me to come back and like, talk to Alex.” Other required paperwork also results in confusion and wild goose chases to get what she needs filled out. It’s frustrating, and ultimately Sam feels it’s on her: “Alright, I’m the veteran, I’m gonna run around campus and figure this crap out.” She has to be cognizant of the rules, because she’s been given advice that simply will not work within the framework of the GI Bill. Of course, the very behaviors that create distance from the community makes it hard to nurture a vibrant vet community. Their roles as spouses and parents, and the need to hold down jobs to help cover the expenses inherent in such roles means few have time or energy to spend attending campus social events. 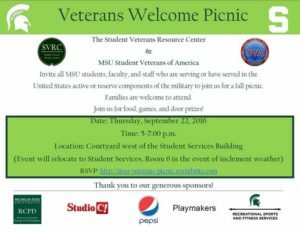 The Student Veterans Association (SVA) and the SVRC are working hard to cultivate the community despite the obstacles, and each offers events to bring Spartan vets together. The SVRC hosts a welcome picnic in the fall, and a spring sendoff, and the SVA hosts an annual Veterans Day brunch. The SVRC also has a program that links incoming vets with peer advisors, as a way of easing the transition and providing outreach to the newest Spartan vets. These advisors help link these new students with the veteran community, by actively encouraging them to participate. For example, the Peer Advisors for Veteran Education (PAVE) advisors invited their charges to the welcome picnic, letting them know that they would save seats at their table so new students would have somewhere to go and a familiar face to link up with. The SVRC has also launched an ongoing yoga class specifically for veterans, which provides a workout (physical fitness remains a priority for many vets) as well as a weekly meeting for participants on campus. The SVRC works very hard to create and environment that makes vets feel welcome and at home. Inside the door, the US, state, and service flags are on display, just as you might find in a company building entrance. 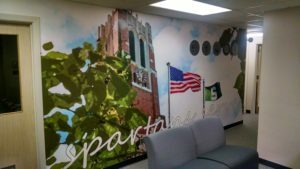 The back wall is adorned with an image of Beaumont Tower and the phrase “Spartans serve” scrolling along the bottom; to the right, the seals of the five branches are mounted on the wall. However, there are some limitations to what the SVRC in particular can do. Predominantly, its location and setting aren’t conducive to community building. 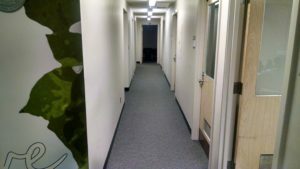 The office is buried in the basement of the Student Services Building with no windows, which doesn’t make it especially inviting. The lobby can’t be seen from the office of the director, and the rooms are very small and cramped. From the lobby, I could hear a conversation from the computer room, and another from the office of the director, but could not see any of the participants. Such small spaces don’t encourage casual visits or provide an atmosphere that promotes hanging out. 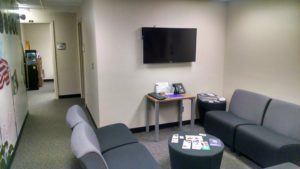 A more open layout would allow vets to interact with others who are there for other purposes, and would promote students getting to know each other. A large lobby, reminiscent of a ‘ready room’ with plenty of seats and space could give vets a place to crash between classes to watch television or chat. As it is, however, the lobby doesn’t invite socialization. As I recorded in my field notes: The space feels small, and I would probably not like it if someone came in and shared it with me. I later noted How do vets feel about this space? Its location? It’s buried in the basement of the Student Services Building, so no windows let in light or fresh air. It’s small, and its “L” shape and arrangement mean that Alex is out of the line of sight of the main area. This observation led me to contemplate how others experienced this space. This perception was reiterated by Sam: “I feel like our location is one of the biggest issues with outreach, because even people who do know we’re here don’t want to come all the way to the north side of campus to the very basement of a place, because it’s depressing, and far away.” On top of which, Sam suggested that the isolation of the location and the closed off layout can be ominous. “There could be a situation and you don’t even know, and that’s scary.” It’s hard to foster a sense of community when the physical space works against it. During the course of my field work, I became increasingly cognizant of the role the SVRC plays in keeping vets connected to MSU. 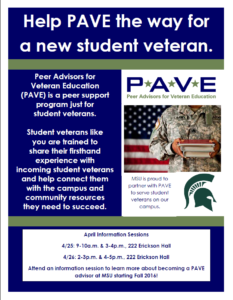 It is the best resource MSU has for helping vets navigate school. As Alex, who works at the SVRC said, “There’s definitely like, not only a transition into the university, but the progression through, and the process of leaving the university into either post-graduate work or employment.” I have been in the habit of stopping in between classes to use the printer, or to ask staff quick questions, and as a resource it has proven invaluable. In that time, I was aware that the staff provided me with information that has been crucial to my own success as a student vet, but I perhaps began to take it for granted. This project forced me to take a step back and think about the things that have become a part of routine life. The SVA, however, is keenly aware of what a boon the SVRC is to Spartan vets. They’ve been working to bring the invisible student veteran population into public awareness, starting with the recent “Veteran Awareness Day” they hosted. They have also been stumping all year to ensure that the SVRC continues to provide services to student vets (and family members of service members who attend school on the GI Bill) in the years to come. 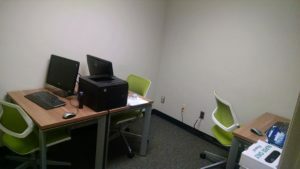 The SVRC is currently funded by a grant, but that grant expires at the end of this school year, and the decision to retain the SVRC is contingent on MSU agreeing to pick up the tab to maintain it. This means that the only full-time staff member may not be around next year, and this could be catastrophic for student vets and for MSU faculty and staff who have come to rely on the SVRC for help with addressing the special needs of vets. As Alex told me, it isn’t just students who benefit from the SVRC; academic advisors can contact her for help handling vet scheduling, and faculty have approached her for advice on addressing the needs of current reserve component students who are called away on short notice for training or deployment. Federal laws protect service members’ jobs when such situations arise, but there is no established guideline for schools.